On the bequest of the Supreme Court of India the seven member committee in the presence of the Head Trustee of Travencore Trust of Sri Anantha Padmanabha Swamy temple at Tiruvananthapur am in South Indian state of Keral have opened the six secret vaults. They have discovered under 20 feet of the ground approximately $ 22 BILLION WORTH OF HIGHLY VALUABLE GOLD in the form of, diamond jewellery, golden utensils, weapons, golden idols, golden elephants idols and diamond necklaces having 500 kilograms weight and 18 feet length and bags full of golden coins of different nations, including NAPOLEON and ITALIAN coins in the last one week. With this Sri Anantha Padmanabha Swamy of Thiruvananthapuram has emerged the richest God on the earth. And this world is looking at the opulence of this God with the mouths opened in a great shock and surprise. 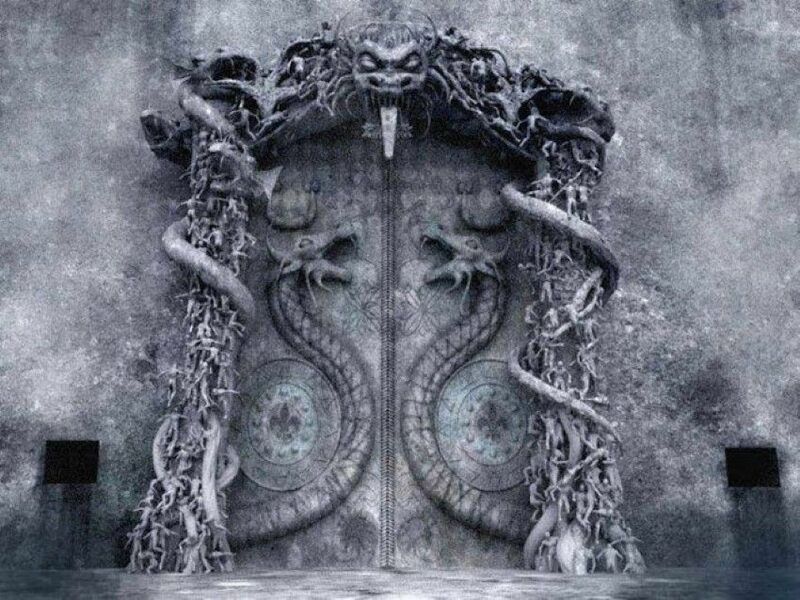 A door of such a secret vault can be opened by a highly erudite ‘SADHUS’ or‘MANTRIKAS’ who are familiar with the knowledge of extricating ‘NAGA BANDHAM’ or‘NAGA PASAM’ by chanting a ‘GARUDA MANTRA’; So except in this way, the door can’t be opened by any means by anyone. At present NO WHERE IN INDIA or in the WORLDsuch a highly sacred and powerful ‘SIDDHAPURSHAS’ or ‘Y0GIS’ or ‘MANTRIKAS’ who does know how to execute highly sacred ‘GARUDA MANTRA’ are EXISTING. If any human attempts are made with man-made technology to open the mysterious Chamber-B other than by chanting highly sacred and powerful ‘GARUDA MANTRAS’ by a highly sacred ‘SADHUS’ or ‘MANTRIKAS’, catastrophes are likely to occour in and around the Temple premisis or through out India or even through out the world according to VEDIC ASTROLOGERS OF INDIA, who also revealed their inability to open the door by chanting the secret ‘GARUDA MANTRA’. There are many legends regarding the origins of the temple. One such legend says that Vilvamangalathu Swamiyar alias Divakara Muni residing near Ananthapuram Temple, Kasargod prayed to Lord Vishnu for his darshan. The Lord came in disguise as a small, mischievous boy. The boy defiled the Saligrama which was kept for Puja. The Sage became enraged at this and chased the boy. The boy disappeared. The Sage reached Ananthankadu searching for the boy. There he saw the boy merging into an Iluppa tree (Indian Butter Tree). The tree fell down and became Anantha Sayana Moorti (Vishnu reclining on Anantha). But the Lord was of an extraordinarily large size with head at Thiruvallom, navel at Thiruvanananthapuram and lotus-feet at Thrippadapuram (Thrippappur). The Sage requested the Lord to shrink to a smaller proportion – thrice the length of his staff. Immediately, the Lord shrank. But even then many Iluppa trees obstructed a complete vision of the Lord. The Sage saw the Lord in three parts – thirumukham, thiruvudal and thrippadam. The spot where the Sage had darsan of the Lord belonged to Koopakkara Potti and Karuva Potti. With the assistance of the reigning King and some Brahmin households a Temple was constructed. Koopakkara Potti was made the Tantri of the Temple. Ananthankadu Nagaraja Temple still exists to the north west of Sri Padmanabhaswamy Temple. The Samadhi (final resting place) of the Swamiyar exists to the west of the Sri Padmanabha Temple. A Krishna Temple was built over the Samadhi. This Temple, known as Vilvamangalam Sri Krishna Swami Temple, belongs to Thrissur Naduvil Madhom. In the sanctum sanctorum, Sri Padmanabha reclines on the serpent Anantha or Adi Sesha. The serpent has five hoods facing inwards, signifying contemplation. The Lord’s right hand is placed over a Shiva lingam. Sridevi, the Goddess of Prosperity and Bhudevi the Goddess of Earth, two consorts of Vishnu are by his side. Brahma emerges on a lotus, which emanates from the navel of the Lord. The deity is made from 12,000 saligramams. These saligrams are from the banks of the Gandaki River in Nepal, and to commemorate this certain rituals used to be performed at the Pashupatinath Temple. The deity of Sri Padmanabha is covered with, “Katusarkara yogam”, a special ayurvedic mix, which forms a plaster that keeps the deity clean. The daily worship is with flowers and for the abhishekam, special deities are used. The platforms in front of the vimanam and where the deity rests, are both carved out of a single massive stone and hence called “Ottakkal-mandapam.” The Ottakkal-mandapam were cut out of a rock at Thirumala, about 4 miles north of the temple, measuring 20 feet square and 2.5 feet thick was brought and placed in front of the deity in the month of Edavom 906 M.E. (1731 CE) In order to perform darshan and puja, one has to ascend the to the mandapam. The Deity is visible through three doors – the visage of the reclining Lord and Siva Linga underneath the hand is seen through the first door; Sridevi and Divakara Muni in Katusarkara, Brahma seated on a lotus emanating from the Lord’s navel, hence the name, “Padmanabha”, gold abhisheka moorthies of Lord Padmanabha, Sridevi and Bhudevi, and silver utsava moorthi of Padmanabha through the second door; the Lord’s feet, and Bhudevi and Kaundinya Muni in Katusarkara through the third door. Only the King of Travancore may perform sashtanga namaskaram, or prostrate on the “Ottakkal Mandapam”. It is traditionally held that anybody who prostrates on the mandapam has surrendered all that he possesses to the Deity. Since the ruler has already done that, he is permitted to prostrate on this mandapam. Among the six kallaras or chambers in the Temple, Bharatakkon Kallara (Chamber B) is very closely associated with Sri Padmanabhaswamy. It is not a part of the Temple Treasury. The holy Chamber houses a Srichakram, an idol of Sri Padmanabha and many valuables meant to enhance the potency of the Principal Deity. It has in it the presence of many gods and sages worshipping the Lord. Kanjirottu Yakshi also resides in the Chamber worshipping Lord Narasimha. The enchanting and ferocious forms of this Yakshi are painted on the south-west part of the main Sanctum. Inside the Temple, there are two other important shrines, Thekkedom and Thiruvambadi, for the Deities, Sree Yoga Narasimha and Sree Krishna Swami respectively. One of the duties assigned to Lord Narasimha is protection of Chamber B. Thiruvambadi shrine enjoys an independent status and predates the shrine of Sri Padmanabha. Thiruvambadi shrine has its own namaskara mandapam, bali stones and flagmast. The Lord of Thiruvambadi is Parthasarathi, the Divine Charioteer of Arjuna. The granite idol of the Lord of Thiruvambadi was brought from Gujarat by seventy two families of Vrishni Vamsa Kshatriyas. As these Vrishnies belong to the lineage of Lord Krishna, they are known as Krishnan vakakkar. The two-armed granite idol, with one hand holding the whip and the other resting on the left thigh holding the conch close to it, is in standing posture. On Ekadasi days the Lord is dressed and decorated as Mohini. There are also shrines for Sree Rama accompanied by Sita, Lakshmana and Hanuman, Vishwaksena (the Nirmalyadhari of Vishnu and Remover of Obstacles), Vyasa, Ganapati, Sasta and Kshetrapala (who guards the temple). Grand idols of Garuda and Hanuman stand with folded hands in the Valiya balikkal area. The foundation of the present gopuram was laid in 1566. The temple has a 100-foot, seven-tier gopuram made in the Pandyan style. The temple stands by the side of a tank, named Padma Theertham (meaning the lotus spring). The temple has a corridor with 365 and one-quarter sculptured granite-stone pillars with elaborate carvings which stands out to be an ultimate testimonial for the Vishwakarma sthapathis in sculpting this architectural masterpiece. This corridor extends from the eastern side into the sanctum sanctorum. An eighty-foot flag-staff stands in front of the main entry from the prakaram(closed precincts of a temple). The ground floor under the gopuram (main entrance in the eastern side) is known as the ‘Nataka Sala’ where the famous temple art Kathakali was staged in the night during the ten-day uthsavam (festival) conducted twice a year, during the Malayalam months of Meenam and Thulam. Temples where ‘Swamiyar Pushpanjali’ is conducted are claimants to extra sanctity. Sannyasins from any one of the monasteries founded by the disciples of Adi Sankara in Thrissur do pushpanjali (flower worship) daily to Sri Padmanabha, Narasimha Moorthi and Sri Krishna Swami. Of these monasteries, Naduvil Madhom is the most important as Vilvamangalathu Swamiyar, the founder of this Temple, belonged to this monastery. Initially, Koopakkara Potties were the Tantries of the Temple. Later, Tantram was transferred to Tharananallur Nambuthiripads of Iranjalakkuda. The Nambies, altogether four in number, are the Chief Priests of the Temple. Two Nambies – Periya Nambi and Panchagavyathu Nambi – are allotted to Sri Padmanabha and one Nambi each to Narasimha Moorthi and Sri Krishna Swami. The Nambies hail from either side of the Chandragiri River. They are appointed by the Pushpanjali Swamiyar. There are many festivals related to this temple. The major festivals are bi-annual. The Alpashy festival which is in October/November and the Painkuni festival which is in March/April, lasts for 10 days each. On the ninth day the Maharajah of Travancore escorts the deities to the vettakkalam for Pallivetta. Centuries back, the Pallivetta procession was said to pass through Kaithamukku, Kuthiravattom (Kunnumpuram), Pazhaya Sreekanteswaram and Putharikkandam. The festivals culminate with the Aarat (holy bath) procession to the Shankumugham Beach. The word Aarat refers to the purificatory immersion of the deities of the temple in sea. This event takes place in the evening. The Maharajah of Travancore escorts the Aarat procession on foot. The festival idols “Utsava Vigrahas” of Sri Padmanabhaswamy, Krishna Swami and Narasimha Moorthi are given a ritual bath in the sea, after the prescribed pujas. After this ceremony, the idols are taken back to the temple in a procession that is lit by traditional torches, marking the conclusion of the festival. Initially, the Padmanabhaswamy Temple and its property were controlled by Thiruvaanandapuram Sabha and later by Ettara Yogam with the assistance of Ettuveetil Pillamar. The Pushpanjali Swamiyars of Sri Padmanabhaswamy Temple preside over the meetings of Thiruvaanandapuram Sabha and Ettara Yogam. In the past, the Swamiyars of Naduvil Madhom were appointed as Pushpanjali Swamiyars by the Maharajah of Travancore with the concurrence of Ettara Yogam. Anizham Thirunal Marthanda Varma curtailed the authority of Ettara Yogam and liquidated the powerful Ettuveetil Pillamar. Ettara Yogam became an advisory and assenting body thereafter. Besides Naduvil Madhom, Munchira Madhom got the right to Pushpanjali during his reign. In the recent past, Uthradom Thirunal Marthanda Varma gave Pushpanjali rights to the Swamiyars of Thrikkaikattu Madhom and Thekke Madhom as well. Though the Maharajah is the appointing authority of the Pushpanjali Swamiyar, the former must do ‘vechu namaskaram’ when he sees the Swamiyar. The Kerala Mahatmyam (an Upa Purana deriving its origin from the Bhoogola Purana) is in the form of a discourse between Yudhishthira and the Sage Garga. It stated that Parashurama after founding Kerala divided the land into 64 gramas, crowned Bhanu Vicrama at Sreevardhanapuram (Padmanabhapuram), and styled him the Kovil Adhikarikal, i.e., the manager of the pagoda of Sreevalumcode (Thiruvananthapuram). The Divya Prabandha canon of Tamil literature by the Alvars glorifies this shrine as one of 13 Divya Desams in Malanadu. The 8th century Alvar Nammalvar sang the glories of Sri Padmanabha. But, the shrine is many centuries older as there are references to this temple in seven puranas namely Bhagavata, Brahma, Brahmanda, Skanda, Varaha, Padma and Matsya. Syanandura Purana Samuchaya in Sanskrit and Ananta Pura Varnanam in Malayalam are two works that give detailed information of the temple city. The temple and its assets belong to Lord Padmanabhaswamy, and are controlled by a trust run by the Royal family. T P Sundara Rajan’s litigations changed the way the world looked at the Temple. The Kerala High Court ordered the temple and its assets be managed by the State on 31 January 2011. As trustees of the temple, the Travancore Royal family have challenged the Kerala High Court’s decision in the Supreme Court of India. In June 2011, the Supreme Court directed the authorities from the archaeology department and fire services to open the secret chambers of the temple for inspection of the items kept inside.The temple has 6 vaults (Kallaras), labeled as A to F for book keeping purpose by the Court. While vaults A and B have been unopened over the past many years, vaults C to F have been opened from time to time. The two priests of the temple, the ‘Periya Nambi’ and the ‘Thekkedathu Nambi’, are the custodians of the four vaults, C to F, which are opened periodically. The Supreme Court had directed that “the existing practices, procedures and rituals” of the temple be followed while opening vaults C to F and using the articles inside. Vaults A and B shall be opened only for the purpose of making an inventory of the articles and then closed. The review of the temple’s underground vaults was undertaken by a seven-member panel appointed by the Supreme Court of India to generate an inventory, leading to the enumeration of a vast collection of articles that are traditionally kept under lock and key. A detailed inventory of the temple assets, consisting of gold, jewels, and other valuables was made. Several 18th century Napoleonic era coins were found, as well as a three-and-a-half feet tall gold idol of Mahavishnu studded with rubies and emeralds, and ceremonial attire for adorning the deity in the form of 16-part gold anki weighing almost 30 kilograms (66 lb) together with gold coconut shells, one studded with rubies and emeralds. This revelation has solidified the status of the Padmanabhaswamy temple as one of the wealthiest temples in India and with the final estimate of the wealth, it might overtake the Tirumala Venkateswara Temple—hitherto thought to be the wealthiest temple—having some INR 320 billion (US$6.05 billion) in gold, coins and other assets. It is estimated that the value of the monumental items is close to INR1.2 trillion (US$22.68 billion), making it the richest temple in the world. If the antique value is taken into account, these assets could be worth ten times the current market price. The valuables are thought to have been in the temple for hundreds of years, having been put there by the Maharajahs of Travancore. While some historians have suggested that a major chunk of the stored riches reached the kings in the form of tax, gifts, as well as conquered wealth of states and offerings stocked in the temple for safekeeping. But it has to be remembered that in Travancore a distinction was always made among Government Treasury (Karuvelam), Temple Treasury (Thiruvara Bhandaram or Sri Bhandaram) and the Royal Treasury (Chellam). During the reign of Maharani Gowri Lakshmi Bayi, hundreds of temples that were mismanaged were brought under the Government. The excess ornaments in these temples were transferred to the Vaults of Sri Padmanabhaswamy Temple. Instead the funds of Sri Padmanabha Temple were utilised for the daily upkeep of these temples. A ferry transported traders, pilgrims and chroniclers across the Gulf of Mannar from the Tenavaram temple, the famously wealthy Vishnu-Shiva temple town emporium to the Chera kingdom via Puttalam of the Jaffna kingdom during the medieval period. This temple was destroyed in 1587 CE, a few years after the Thiruvananthapuram Padmanabhaswamy temple gopuram was constructed. Moroccan traveller Ibn Battuta visited Tenavaram in the 14th century and described the Vishnu idol here as being made of gold and the size of a man with two large rubies as eyes “that lit up like lanterns during the night.” All people living within the vicinity of the temple and who visited it were fed with monetary endowments that were made to the idol. On 4 July 2011 the seven-member expert team tasked with taking stock of the temple assets decided to postpone opening of the chamber marked ‘B’. This chamber is sealed with an iron door with the image of a cobra on it and it has not been opened, due to the belief opening it would result in much misfortune. The royal family said that many legends were attached to the temple and that chamber B has a model of a snake on the main door and opening it could be a bad omen. Seven-member team will consult with some more experts on 8 July 2011 and then they may take the final decision on opening of chamber ‘B’. An Ashtamangala Devaprasnam conducted in the Temple to discern the will of the Lord revealed that any attempts to open the Chamber B would cause Divine displeasure and that the holy articles in the other chambers were defiled in the inventorying process.